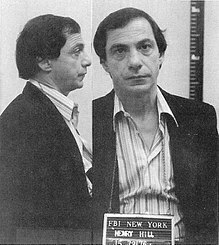 On June 11, 1943, mobster Henry Hill, whose life of crime was chronicled in the 1986 book Wiseguy: Life in a Mafia Family and the 1990 film Goodfellas, was born in New York City. Hill’s underworld exploits included participating in the headline-making multi-million dollar heist at the Lufthansa cargo terminal at New York City’s JFK International Airport in 1978. It was the largest recorded cash robbery in American history at the time. Hill, the son of an Italian-American mother and Irish-American electrician father, was attracted from a young age to the flashy lifestyles of the local mobsters in his Brooklyn neighborhood. In the mid-1950s he started working as an errand boy for a mob-operated taxi stand and pizzeria near his home. At age 17 Hill enlisted in the Army and was stationed at Fort Bragg, North Carolina. He continued his involvement in small-time criminal activities while in the military and was discharged after several years. Back in New York, Hill, as an associate of the Lucchese organized crime family, participated in a host of illegal pursuits, including truck hijackings, loan sharking and drug dealing. In the 1970s he spent more than four years in prison for an extortion conviction. When he got out, Hill took part in the theft of $5.8 million in cash and jewels from the Lufthansa cargo terminal at Kennedy Airport. Also in the late 1970s, Hill orchestrated a scheme in which members of the Boston College men’s basketball team were bribed to fix games. In 1980, after being arrested on drug-trafficking charges, Hill, fearing his associates would kill him out of concern he might confess to the authorities, decided to make a deal with the government and become an informant. He went on to testify against a number of his fellow mobsters and helped put dozens of people behind bars. Along with his wife and two children, Hill spent time in the federal witness protection program during the 1980s, but he was eventually kicked out for drug offenses. While he was in the witness protection program, Hill gave a series of interviews to journalist Nicholas Pileggi, who went on to write a bestselling about Hill. The book was adapted into the critically acclaimed film Goodfellas, directed by Martin Scorsese. As he grew older, Hill never fully reformed his ways and was arrested for numerous charges during the last decade of his life. After suffering from various health issues including heart disease, Hill died at age 69 in a Los Angeles hospital on June 12, 2012.